Today is also "Poem in Your Pocket Day" and the perfect moment to encourage kids to find a new or favorite poem, copy it on an index card, and keep it in their pockets to enjoy and savor all day long (and beyond)! And of course we have a pocket poem in our new CELEBRATIONS book! And who wrote it? My fantastic friend and collaborator, Janet Wong! Here it is in both English and Spanish. You'll find heaps more poems in the form of Pocket Poem cards at our Pinterest page HERE. And Melissa R. has videotaped a young reader performing the poem, too, complete with voiceover while she's eating and reading a card! 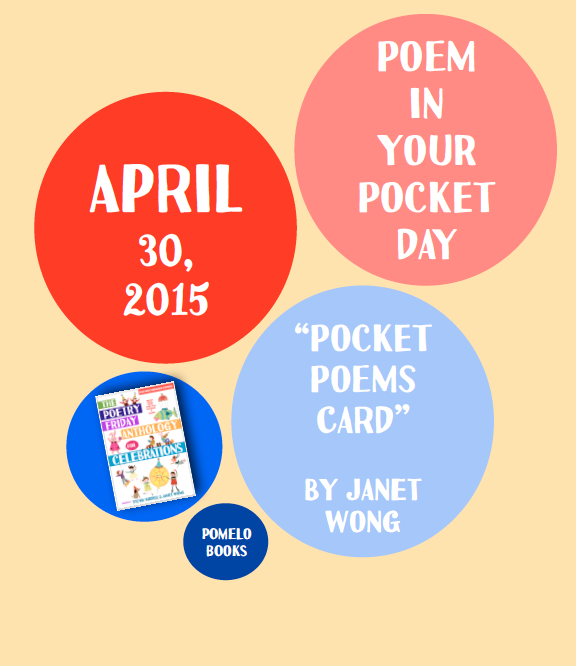 For more information about Poem in Your Pocket Day, click HERE. 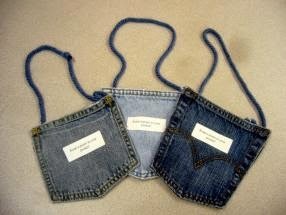 There are many clever and practical ideas presented! For the full text of this poem and 150+ more (all in English AND Spanish), order your own copy of The Poetry Friday Anthology for Celebrations HERE and for more Poetry Celebrations fun, click HERE. Plus for more on National Poetry Month, click HERE. It used to be in November, but it’s been a May event for awhile now and I’m happy to report that we have a poem for Book Week coming up in our CELEBRATIONS book. 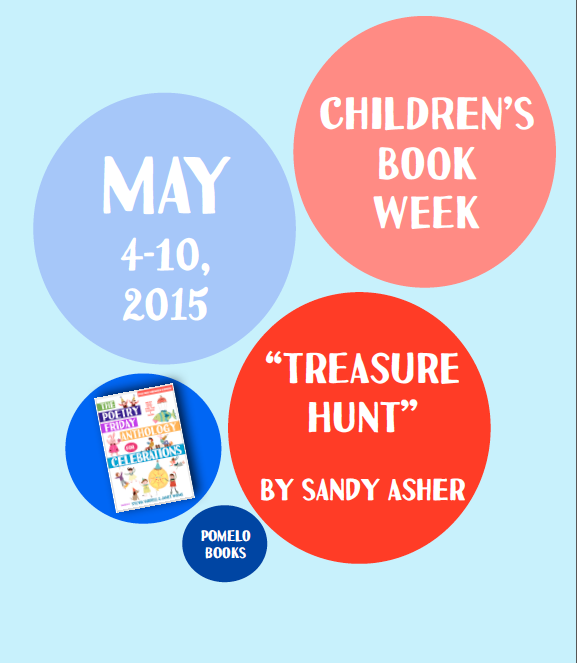 It’s “Treasure Hunt” by Sandy Asher. Laura D. has recruited a young reader to perform this poem in both English and Spanish. For more information about National Children’s Book Week, check out the Children’s Book Council site HERE. And we’re excited to be one of the few publishers offering a POETRY-themed “Event Kit” for Book Week this year. It includes reproducibles, game and coloring pages, bookmarks, and a word search featuring the word “poetry” in 20 different languages! In just a few days, we’ll be celebrating El día de los niños, El día de los libros; Children’s Day, Book Day. 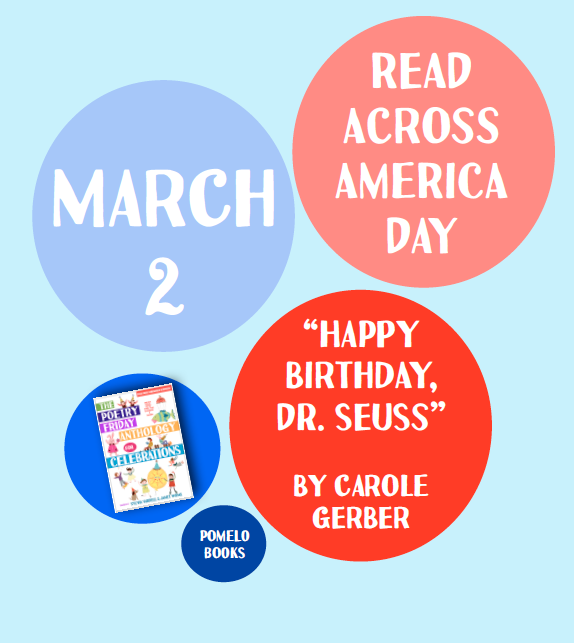 It’s officially on April 30, but you can certainly celebrate books and children any day! 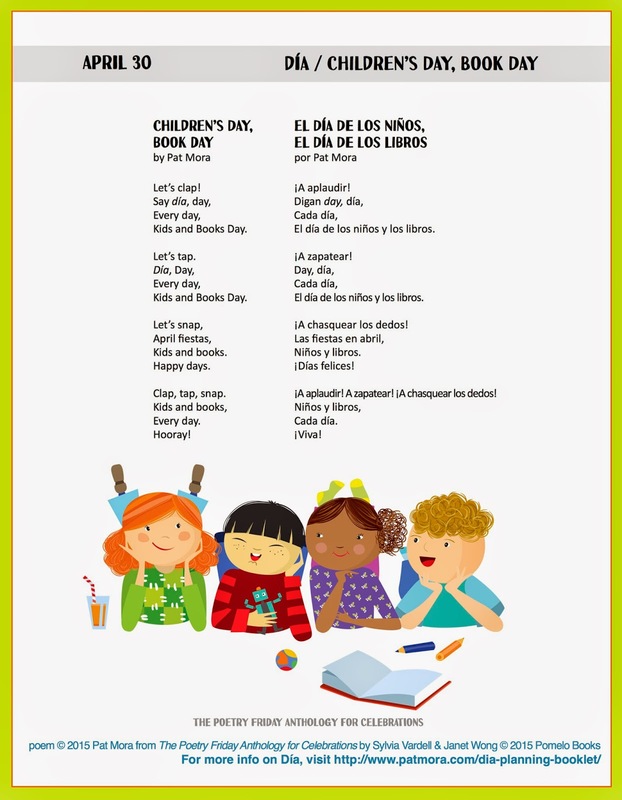 Día (for short) originates with poet, author, and literacy advocate Pat Mora and we are so thrilled to have a poem in honor of this multicultural celebration of children and books penned by Pat herself. 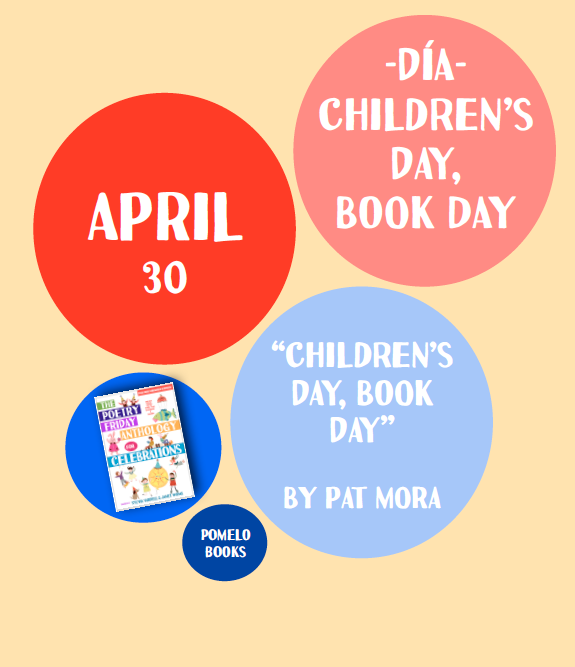 And for more about Pat Mora, click HERE and for more about celebrating Día, click HERE. Summer is right around the corner and we want to be sure to encourage kids to keep reading even after school is out. Here’s a poem that celebrates Summer Reading Month in June. 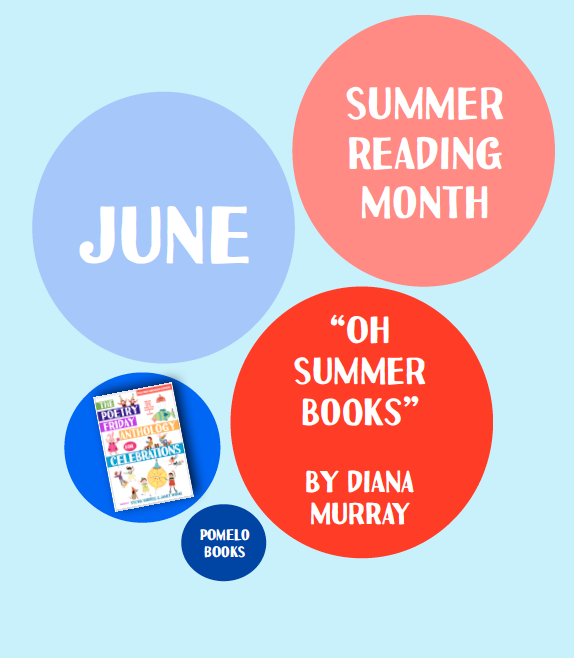 It’s “Oh, Summer Books” by Diana Murray and Kaela L. has recruited a young volunteer who reads the poem with such expression that she really captures the spirit of the poem. I read once that kids laugh on average 400 times a day! And adults only laugh about 15 times a day! And since laughter is supposed to be good for the heart, nervous system, and even digestion—not to mention our emotions and well-being—I think we need a lot more laughter in our lives. 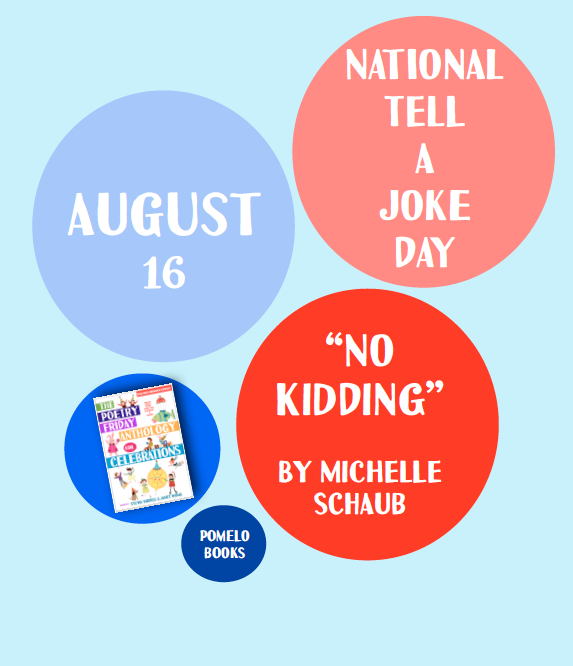 Watch these young readers performing “No Kidding” by Michelle Schaub in celebration of National Tell a Joke Day which occurs every August 16. (Make plans now!) Here’s the video created by Brooke H. I love that she got two students involved who come from other countries originally—reading both the English and the Spanish versions of the poem. And don’t miss the blooper footage complete with music! In this age of "reduce, reuse, recycle," it's a good reminder that thrift shops help us do that with material goods-- as consumers and as providers. And children can start young with the notion of donating to help others. 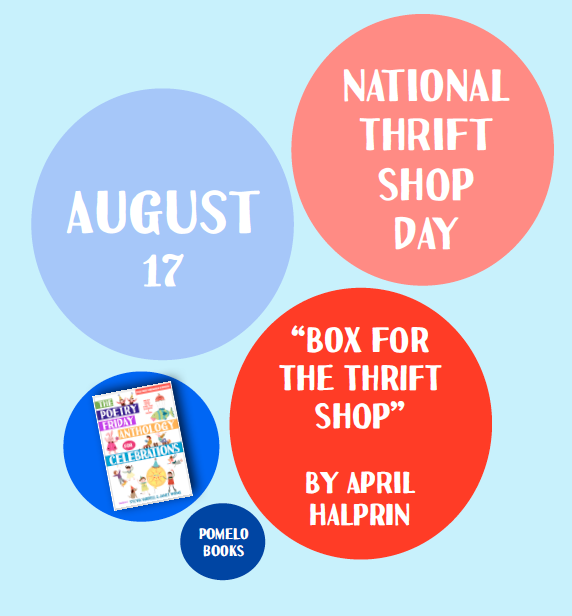 Here April Halprin Wayland conveys a child's mixed feelings in a very clever and tender way in her poem, “Box for the Thrift Shop." Juli P. has her two young performers reading both the English and Spanish versions of this lovely poem here. Plan now to donate goods (and/or visit a thrift shop) on August 17, National Thrift Shop Day. And encourage children you know to participate with you, too. And would you like to know what Emily Post has to say about National Etiquette Week? Click HERE. Cheryl T. has recruited two very young readers to perform Buffy Silverman's poem, "At the Farmers’ Market” here even talking about their favorite fruits and vegetables at the end. 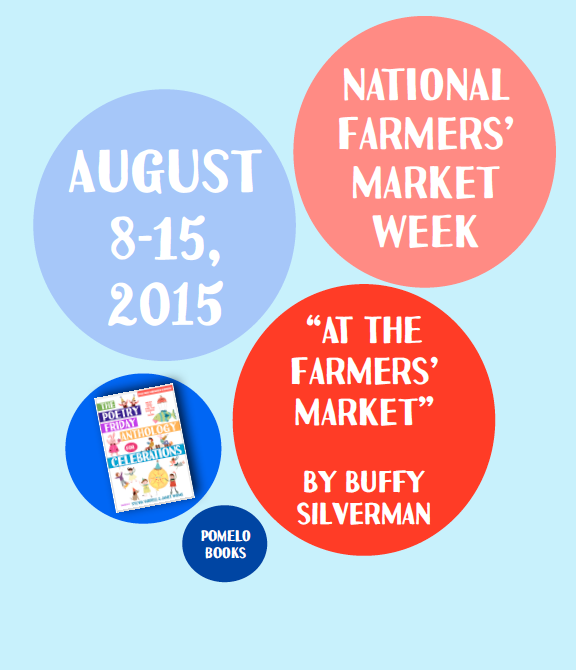 Add a bit of fun to sharing this poem in honor of National Farmers’ Market Week with a poetry prop—show a piece of fruit or a vegetable (or an empty shopping bag) before reading the poem aloud. If you have enough to share and eat, even better! Invite children to select their favorite fruit or vegetable named in the poem and to chime in just on that word while you read the rest of the poem aloud. Talk about the difference between a grocery store and a farmers’ market (where produce is usually sold by the producer). Pair this poem with the picture book To Market, To Market by Nikki McClure (Abrams, 2011) and encourage children to share their own experiences with gardens or markets. Connect with “A Marching Band of Vitamins” by Michele Krueger (June, pages 158-159) and with poems from Busy in the Garden by George Shannon (Greenwillow, 2006) and In Our Backyard Garden: Poems by Eileen Spinelli (Simon & Schuster, 2004). 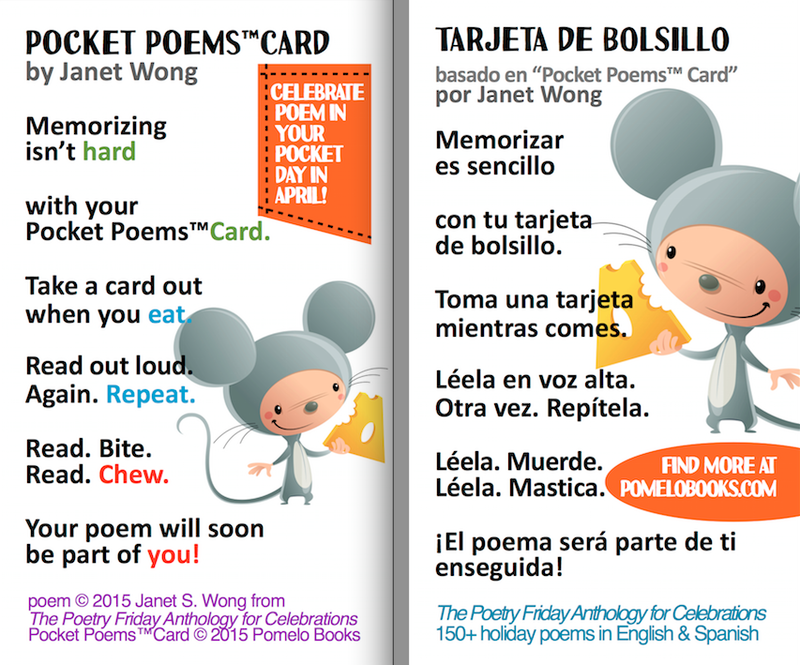 For the full text of this poem and 150+ more (all in English AND Spanish) along with "Take 5" activities for every poem, order your own copy of The Poetry Friday Anthology for Celebrations HERE and for more Poetry Celebrations fun, click HERE. Plus for more on National Poetry Month, click HERE. Want to know more about this special day? Click HERE. Want a poem to celebrate this day and our planet? 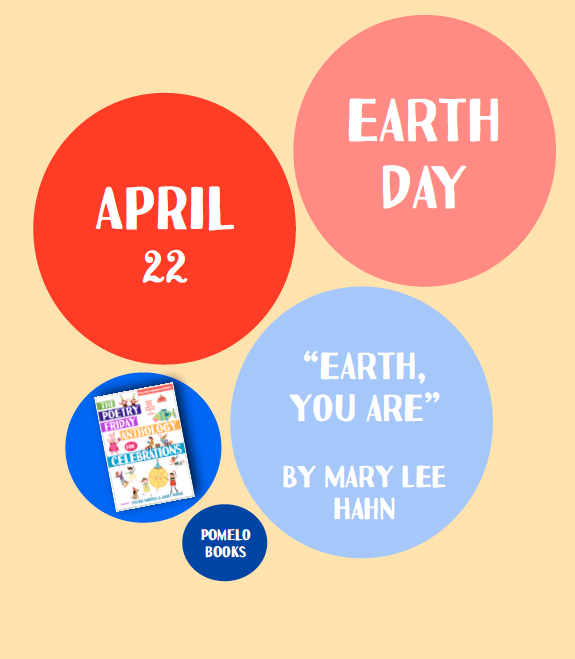 Look for Mary Lee Hahn's "Earth, You Are"
in The Poetry Friday Anthology for Celebrations. Want to see a global selfie” that NASA created to celebrate Earth Day? California is experiencing severe drought conditions and rationing water. It's a good reminder of what a precious and essential resource water is. Poet George Ella Lyon feels passionately about this topic and has authored a poem about it, “World Water Day," as well as a beautiful picture book, All the Water in the World by George Ella Lyon (Atheneum, 2011). Here, Sharon T. has recruited a teenager to read George Ella's beautiful poem. March 22 is officially World Water Day and you can learn more about this United Nations celebration HERE. Want to help children learn about the time change every March? Here's a poem to help you remember and to pull out again in October when it's time to switch again. Elena B. has gathered readers the library to read the poem “Daylight Saving Time” by Shirley Duke in both English and Spanish. Enjoy! Use a real or toy clock or watch as your poetry prop as you read this poem aloud. Invite children to join in on the first line of each stanza (Spring forward! and Fall back!) while you read the rest of the poem aloud. Talk about the pros and cons of changing the clock twice a year based on the details in this poem. One resource is TimeAndDate.com. Pair this poem with the picture book Now & Ben: The Modern Inventions of Benjamin Franklin by Gene Barretta (Square Fish, 2008) and talk about the many ways Ben Franklin’s ideas have shaped our lives today. Connect this with another poem about the changing of seasons, “The Rollerbears” by Jack Prelutsky (October, pages 260-261), and with poems from Once Around the Sun by Bobbi Katz (Harcourt, 2006) or Sharing the Seasons edited by Lee Bennett Hopkins (McElderry, 2010). When I was a little girl, I loved collecting pennies and putting them in those hard blue folders with the circles for holding each penny. (I still have that collection more than 50 years later!) And I love keeping a coin from each country I visit too. So I was tickled to discover there is a bona fide holiday celebrating COINS! And that holiday starts TODAY! Yes, it is National Coin Week this week, April 19-25, 2015. To celebrate, let's pause for a poem about coins. Cynthia H. has gathered a group of four young readers with each girl taking one stanza of the poem, reading with a lot of enthusiasm and in both English and Spanish. Plus, Cynthia has added visuals, music, and sound effects (clinking coins!). Enjoy their reading of "Pocket Change" by Kelly Ramsdell Fineman. And do you want to know more about such numismatic events? For more information about National Coin Week, click HERE. Letter writing may be a dying art, but it's still important to know how to communicate, whether by email, text, tweet, note, OR letter. Need a model of how to? Check out this poem, "Sincerely" by Robyn Hood Black. Here, the narrator in Jenny G's video has really captured the spirit of the poem with such a great smile and clear enunciation. And don't miss the hilarious blooper bits too! You can share this lovely poem next March during National Write a Letter of Appreciation Day or ANY DAY when you want to nudge children to try writing someone they care about. You'll find a Pocket Poem card version of this poem at Pinterest too right HERE. We have a whole "board" of CELEBRATION Pocket Poems there to share and enjoy. Just click HERE. This video of Andy reading "Picky Eater" by Matt Forrest Esenwine is hilarious. Watch him keep his composure as boxes of breakfast cereal are tossed at him! Plus, he reads both the English AND Spanish versions of this poem beautifully! Thank you, Cynthia A. for this awesome video! 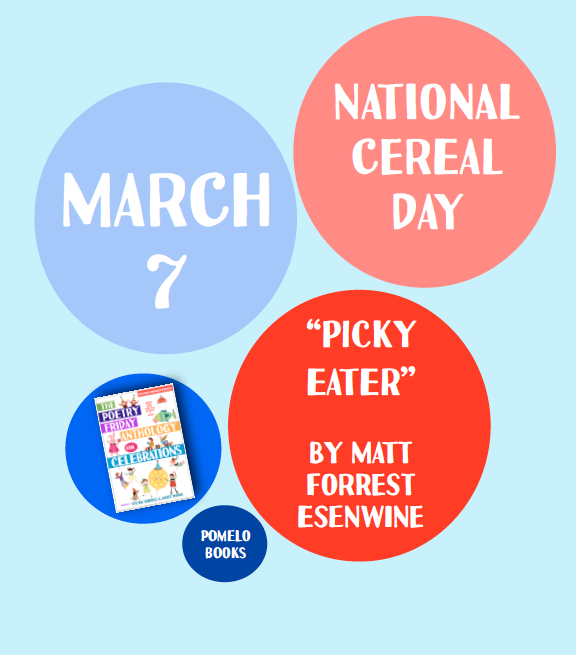 Yes, there is an actual National Cereal Day on March 7, but this poem is fun to share on any day you're eating cereal-- and that's nearly every day for me! Want to know more about this unique holiday? There's a dedicated website, of course. Just click HERE. This is the week for the annual conference of the Texas Library Association and today I'm leading the 11th annual Poetry Round Up-- always a popular session. In honor of our 11th anniversary, I'm hosting 11 poets too: Jorge Argueta, Brian Rock, Leslie Bulion, J. Patrick Lewis, George Ella Lyon, Kenn Nesbitt, Micol Ostow, K.A. Holt, Nancy Bo Flood, Janet Wong, and illustrator Don Tate reading from his new book, Poet. (Lee Wardlaw was scheduled to come, but has had to postpone till next time.) Of course, I'll bring a full report (and maybe videoclips) later on this blog. Meanwhile, here's another poem-plus-video to enjoy! Renee M. LaTulippe provides today's marvelous poem, "Friends," in honor of International Day of Persons with Disabilities (held every December 3). Joni H. has organized this video and features two young readers who really capture the spirit of the poem including their own drawings and a bit of discussion in response to the poem. For more information about International Day of Persons with Disabilities sponsored by the United Nations, click HERE.